More than 350 people were arrested in demonstrations on Saturday in Paris. The protests began on November 17 over an increase in gas prices. France president Emmanuel Macron is chairman of an urgent security meeting in Paris to discuss the riots that have spread throughout the country and can explain an emergency to contain unrest. 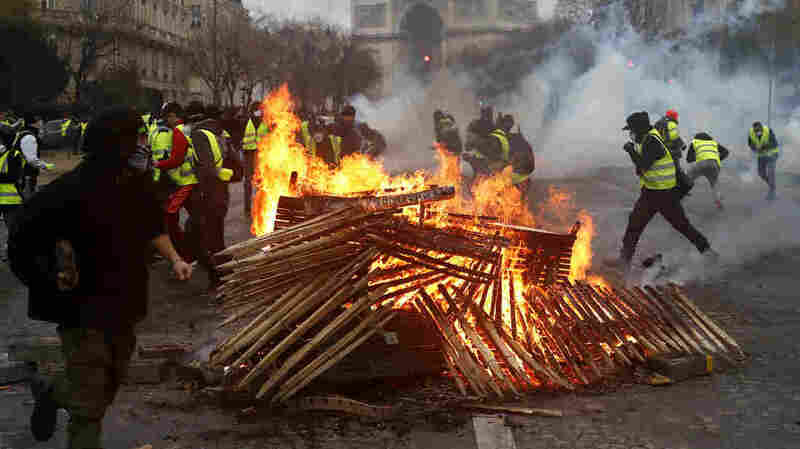 The “Yellow West” demonstrations were called for the roads protected by the protesters, began last month over an increase in gas prices and have evolved into protests over the tall settlements in France. Earlier on Sunday, Macron visited the Arc of Triumph to investigate the damage there. At least three people have died in the protests since they began, all in traffic accidents caused by blockades made by yellow westerners. The protests have no obvious leaders, making it difficult for the French government to negotiate or meet them. “It’s clear that the government does not really know how to respond,” Beardsley reports. “This kind of motion has never happened before. Usually you have unions that you can handle or managers you can handle.” The current protests, says Beardsley, are a fluid and ever-changing movement without clear leaders. Extremists left and right, anarchists and vandals have joined the demonstrations. In Paris, the protesters sprayed the Arc de Triomphe with graffiti, twisted cars and put them on fire and crushed shop halls. The French government says it is considering all options to control the protests and stop the violence.